Yup, apparently I am in the black hole of the PCT called The Anderson’s. Joe made a pancake breakfast like he does every morning. Apparently they went through 350 pounds of pancake mix last year. Hoping to head out tonight after dinner. If I can just go a few miles and then camp it will be easier to get going tomorrow. Some people are hungover, others are sleeping, others are painting. Ok, so I haven’t left yet. Decided to get the website updated and all my email answered. UB is here (ubserious.com) and he asked me if I could help out with a video project he was going to work on this Friday. From the next resupply a couple days ahead, he is going to have a bunch of people carry glow sticks and night hike the LA Aqueduct. More details on this later. 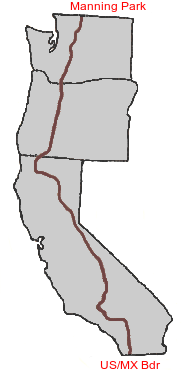 The PCT follows the LA Aqueduct and related area for about 20 miles. A lot of hikers hike it at night to avoid the heat since there is no shade. (I hiked it in November 1996, so it was not an issue for me). Ended up hanging out and having a good time with everyone. I was talking to UB and he was asking me about this site and how I had gotten it linked up off pctplanner.com. I told him that I was “that Craig”. He got excited and yelled to Muk Muk, “Muk! That website you used, this is the guy!” Muk Muk got all excited and ran over and hugged me, then wanted a photo of us together. This has happened a few times now, I will see someone several times on the trail and then a week or two later they put the two and two together. The beer supply was running low so a couple guys decided to go on a beer run with a wheelbarrow. I tagged along to document the journey. Had a huge plate of nachos for dinner and then there was an impromptu dance party afterwards. At one point I saw an empty spot on the couch and sat down. I realized that I had placed myself between two couples…suddenly I was getting flashbacks to parties in high school. Without even saying anything I yelled at Corey who was sitting nearby. “Corey! Can I borrow you for a second?”, I said. He came over and I handed him my camera and asked him to take a photo of us. “Ok, you all [motioning to the couples next to me]….start making out”, I said. About .000025 seconds later I was Mick Fleetwood on that old Rolling Stone cover. We ended the night by watching videos on my phone. Matt and Crossover liked the Heavy Metal Parking lot from the day and wondered what else I had up my sleeve. I went with the obvious….the Farting Preacher videos, what else? They all laughed pretty hard and we called it a night. By the time I made it up to my tent in the Manzinita Maze. Matt and Crossover were camped near me and I could hear them giggling among the other sleeping campers. After about two minutes when it got all quiet I made a giant farting noise and could hear them erupt with laugher off in the distance. Muk Muk found out I made the PCT planner so she wanted a photo with me. Muk Muk and UB watching my video I made of Bonzi. Hey..it is me in high school.